Christmas time, is a wonderful time of the year. A wonderful time, to walk in what we believe. 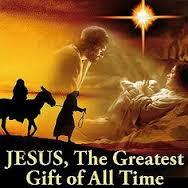 The message of Christmas, is about the great love of God, He has for His creations. God giving of Himself. Some might say, Christmas has turned into consumerism giving, giving for the sake of giving, giving to get something in return. Well God gave of His best, and He knows the heart of men and women, and there was nothing He could get in return, that would match the value and love of His Gift. Perhaps random gift giving, is more the God kind of giving. Giving so others will be blessed. There are many for whom, Christmas is over whelming, because the monetary cost high. But Christmas is not suppose to be like this, it is a time to bless, those who are hurting, we may not get anything in return, but a smile from them would be an awesome gift. Let challenge ourselves this Christmas, what can we give to those who are overwhelmed, by the Season, or those who don’t celebrate the season, because they see no reason. We might not get anything in return, but if Our Lord, and Our Friend, gets Glorified, who knows, another brother or sister maybe added to His Kingdom. Jesus is The Reason for the season, let our Christmas this year be more about Him and less about us, so people can see the great love God has for them, through His Son Who came as The Christ Child.